Comfort: Smooth running with low vibration levels is achieved through a dynamically-balanced design incorporating highly efficient rubber isolation. Lower engine speed together with an inlet air silencer reduce noise levels and contribute to increased onboard comfort. Marine torque: This engine delivers high torque at low rpm. That means plenty of power and quick response when maneuvering in a marina, in strong head wind, and in confined spaces. 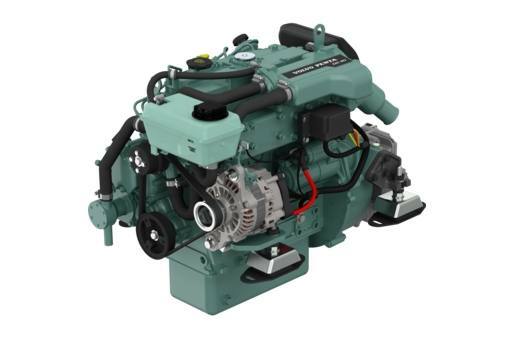 Solid and robust engine: With a rigid engine block and a one-piece cylinder head, this Volvo Penta marine diesel engine is designed and built to be immensely strong. This gives excellent reliability and long service life. Freshwater cooling: The engine is fitted with freshwater cooling as standard. This reduces internal corrosion and enables the engine to maintain a consistent and optimal working temperature under all conditions. Efficient charging: High-capacity charging is standard. The 115A alternator has an electronic sensor which enables ahigher battery capacity. Even at idle speed, the alternator gives more than 35A, and at cruising speed it delivers approx. 100A.